Here at Lisa Miller & Associates, we especially admire those who are using innovation and entrepreneurship to help Florida’s insurance consumers and marketplace. Count among those Eron Iler, a Tampa Bay area Marine who has developed a free phone app that helps link people who need help during a hurricane or other disaster with those looking to help. The new app is named Aftermath Data and allows users to sign in as either needing or offering help and collects their data in real time. Now, on to the rest of the news! For the past several weeks, a team of us have worked with Florida Representative David Santiago (R-Deltona) and Senator Jeff Brandes (R-Pinellas County) in crafting simple and permissive language to create and nurture a flexible and transparent private flood insurance regulatory framework in every state in the country. We used, as the basis for the 1 1/2 page draft product, Section 627.715, Florida Statutes which is Florida’s private flood insurance statute, first enacted in 2015. 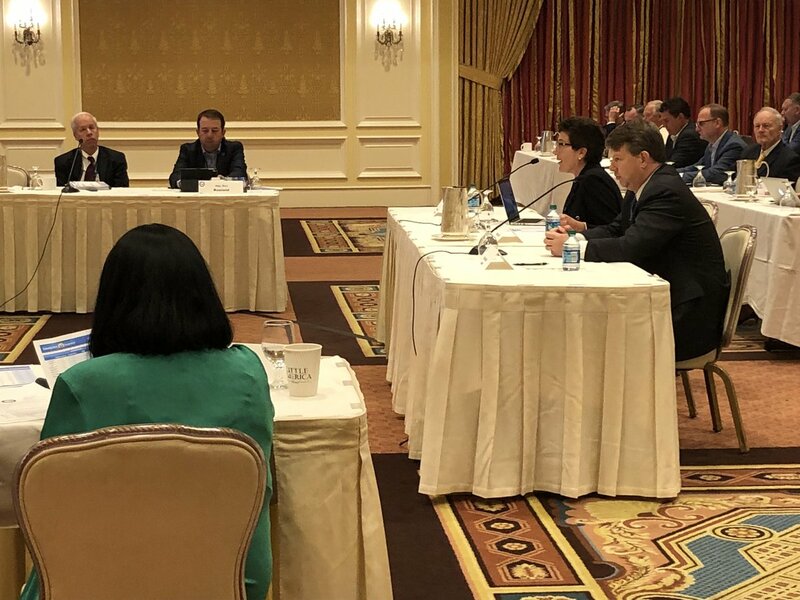 The venue to have this simple narrative added as a “Part V” to a national, model flood disaster relief bill was the National Council of Insurance Legislators (NCOIL) meeting last week in Salt Lake City Utah. You can view the Part V language hereand see my remarks to the group here. While those of us in Florida know the successful outcome of Florida’s private flood insurance legislation (22 companies in the marketplace and more writing this peril every day), many in the industry were concerned that this language, while primarily permissive throughout with the use of “may” instead of “shall,” was overreaching and many believe still, that states do not need this at all to promote a private flood insurance market. What isn’t in dispute is the significant premium savings overall that the private insurance market is bringing to consumers. Click here for a comparison. We will be continuing to work with those who follow NCOIL activity to educate them on the necessity of basic ground rules for a regulatory framework to promote a private flood insurance market and to start the conversation, state by state, about it. Using a bill such as this is a simple way to signal progress and remove doubt as to how a private flood insurance market can start and thrive and is designed to provide suggestions to regulators and those regulated on how to work together to launch a market. The sooner we do this, the better, as we wait, yet again (for the 13th time in a handful of years), for Congress to decide what to do with the National Flood Insurance Program. We want to thank Rep. Santiago who serves as Vice Chair of the NCOIL committee who deliberated Part V and moved the needle so it could be refined and we hope voted on, in its entirety, in December at NCOIL’s winter meeting. Once it is adopted, then we will be calling on you to help us get it adopted in every state. While Congress considers yet another short-term reauthorization of the National Flood Insurance Program (the current version of the NFIP expires on July 31) FEMA continues its flood re-mapping of Florida communities and now says it will announce a risk-rating “redesign” next year in an effort to more realistically price risk. Neither the new maps nor the effort to better price rate to risk is meeting with much enthusiasm unfortunately, in part due to the dysfunction of our public flood program: Residents don’t want to pay for flood insurance if the federal government through FEMA will bail them out and while the Feds try to actively encourage flood insurance purchase and the banks in certain circumstances require it, we still continue to watch the NFIP policy count shrink. It’s one of the biggest reasons we need to encourage a vibrant private flood market across the country. Gulf County, in the Florida panhandle, is typical of what’s going on right now on in many communities during FEMA re-mapping. FEMA published preliminary mapslast year based on 1980’s models which would move almost 1,400 properties in this sparsely populated county from an “X” zone to an “AE” or “VE” zone, likely requiring flood insurance for federally mortgage-backed homes. The county and its water management district appealed, fearing a great impact to construction and insurance costs. They raised the funds to survey the county using LIDAR (the more accurate technology that measures distances and elevation using laser light), and is submitting the data to FEMA to show that less than 1,000 homes could be moved into higher flood risk zones. This exercise is taking place all over Florida. Again folks, a big part of the solution to both these woes is a vibrant private market to supplement the NFIP. Flood risk is rising in Florida. There’s dysfunction in FEMA’s mapping process and its rates. 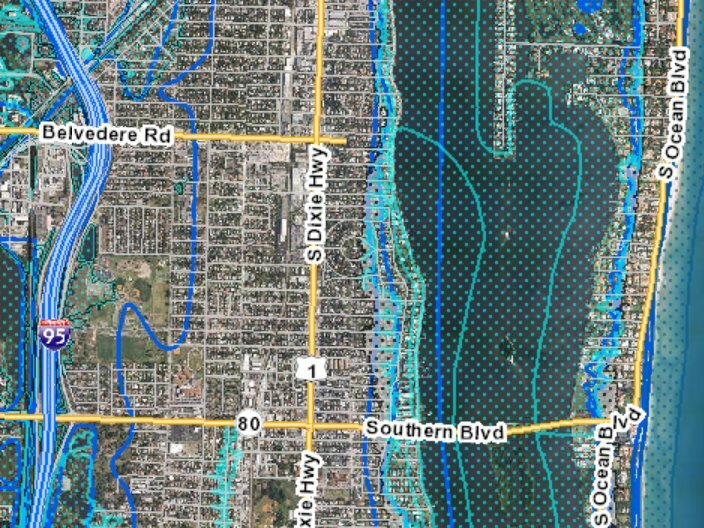 FEMA mappers spend years and millions of taxpayers’ dollars mapping a community to determine flood vulnerability and then the community spends years and millions of taxpayers’ dollars fighting the changes. Many in the emerging flood insurance debate are adopting a motto of “Scrap the Maps” and “Move to (Catastrophe or Cat) Models” instead. Cat Models and highly sophisticated computer analytics are the reason we are seeing published rate savings over NFIP. With the NFIP in debt to the tune of nearly $25 billion, shifting risk appropriately to the private market is both smart public policy and increases the availability and affordability of flood insurance for consumers. Sketch of a “Keys Cottage” being built to replenish affordable housing destroyed in Hurricane Irma on the Florida Keys. The federal government has approved Florida’s plan for using $616 million in federal hurricane recovery housing assistance money. HUD Secretary Ben Carson praised Florida’s disaster response strategies as a model for the nation in approving the 165-page state Action Plan, to replace and repair damaged homes, build new affordable housing and provide grants to severely impacted businesses. $75 million of that will be used for a voluntary home-buying program in those repetitive flood loss areas mentioned in our previous newsletter article. Florida’s plan anticipates purchasing about 300 flood-prone properties at an average of $225,000 each. It caps voluntary buy-outs at $5 million per acquisition. The $616 million received from the federal Community Development Block Grant – Disaster Recovery (CDBG-DR) program is in addition to the $791 million HUD released to Florida in April for remaining unmet needs from direct Hurricane Irma damages and to support mitigation activities. Some of that money will be put to use in Monroe County and the Florida Keys – areas hardest hit by Hurricane Irma’s 115 mph winds. In Big Pine Key, construction is already underway to rebuild affordable housing for the working class of the Keys who support the tourism industry and the year-round population. 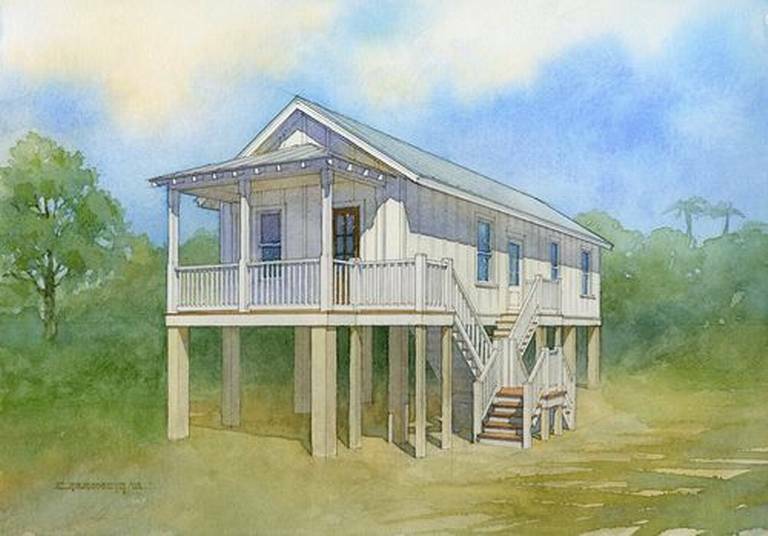 Pictured here is a sketch of one of four “Keys Cottages” being built by the nonprofit Florida Keys Community Land Trust with monies from the County and other nonprofits. The 760 square foot two-bedroom homes are raised 12 feet and should be completed by the end of August. Each cost $199,000 to build, plus $99,999 for each lot. Ground has been broken for the next phase of larger 3/2 homes, all of which are reserved as affordable rental housing at upwards of $1,600 rent per month, according to this Miami Herald article. In other post-Irma news from the last several weeks, Florida’s dairy farmers are still fighting for their share of federal relief monies. Although the state’s citrus crop was covered under the Wildfire and Hurricane Indemnity Program, dairy was not, because technically, milk isn’t considered a crop under USDA interpretation. No cows were lost in the storm, but production suffered due to the cows’ stress and power outages. Meanwhile, the Weiss Ratings organization was quoted as saying that weaker insurers have fallen behind in paying post-Irma claims. Weiss’ chief researcher Gavin Magor was quoted in a company news release saying that “Many Florida homeowners are still waiting for their insurance claims to come through after a severe hurricane season last year. If the 2018 hurricane season is similar or worse, it could compound the problem, raising questions about the ability of weaker insurers to promptly cover major damages.” The Weiss organization’s analytics have been called into question in the past and insurance industry groups and Florida’s insurance regulator paint a very different picture. Almost all claims have been closed but many were closed without payment because the damage was minimal and under a homeowner’s deductible. Perhaps Weiss will issue a correction and use data from the Office of Insurance Regulation in its future releases. A federal judge has put to rest, perhaps for good, whether the practice of using red-light cameras in Florida is legal. U.S. District Court Federico Moreno sided with more than 70 cities and counties in dismissing a class action seeking refunds for motorists who had been ticketed after the cameras photographed those running red lights. The case (Jimenezv. State of Florida)case had charged that the city of Aventura had given too much authority to its vendor, American Traffic Solutions, in decided which cases should be prosecuted. As we reported last year, Aventura’s procedures were different than other communities that have been successfully sued in the past: police make the decision about ticketing motorists, weighing the evidence in the pictures and using professional judgement whether probable cause exists “in the same manner they decide to issue a roadside citation,” according to an earlier 3rdDCA decision which sided with Aventura and kicked the matter up to the state Supreme Court. So long as city officials are the ones ultimately issuing citations or fines, the use of red-light cameras is constitutional in Florida. At stake were red-light camera programs in 70 municipalities, which in a recent year issued about 963,000 such tickets. The state, which gets 58% of the citation revenue, also weighed in on the issue, with Attorney General Pam Bondi siding with the city of Aventura in its case. The Florida legislature has declined to pass several bills over recent years to regulate and outright outlaw the use of red-light cameras, pending the outcome of this decision. We’ll be watching to see if the issue comes up again in the 2019 legislative session. One of the many subplots to the drama that’s become legalization of medical marijuana in Florida is whether patients are allowed to smoke pot. A three-judge panel of the 1stDistrict Court of Appeal recently said no, overturning a circuit court decision, criticizing the judge who made it, and essentially telling all parties to cool their heels and let the legal process play out. The ruling came from a lawsuit brought by Orlando trial lawyer John Morgan, who backed the original state constitutional amendment legalizing medical marijuana in Florida. Once it was passed by voters in 2016, Morgan claimed the amendment allows for smokeable medical pot. Leon County Circuit Court Judge Karen Gievers agreed, swayed by testimony this spring from two patients, one with Lou Gehrig’s disease and the other with neuralgia associated with HIV, who both claimed smokeable marijuana provides them benefits other forms do not and that they would suffer without it. Judge Gievers ruled in favor of the patients, but the state immediately appealed, which automatically stayed the judge’s order. Judge Gievers later lifted that automatic stay, ruling the state hadn’t made a convincing case that it had a chance to win the appeal and that no harm would come to the state if the stay were lifted. The 1stDCA panel noted that a court may overturn such a stay only “under the most compelling circumstances.” The judges also criticized Judge Gievers, saying “it was an abuse of discretion for the circuit court” to lift the stay. Morgan, in reaction to the 1stDCA ruling, said in news accounts that the state Supreme Court should now take up the matter. But the 1stDCA has declined to send it along to the Supreme Court. We’ll stay on top of this and the other subplots of medical marijuana, including whether patients have the right to grow and use their own plants – another challenge that is making its way through the judicial process. Amendment 10 is actually four proposals in one amendment. It wouldrequire the Florida legislature to keep the Office of Veterans’ Affairs; require the legislature to hold its annual session in January of even-numbered years (lawmakers currently choose for themselves); establish the Office of Domestic Security and Counterterrorism within the Florida Department of Law Enforcement (FDLE); and require charter counties to elect all officers, including tax collectors and sheriffs, rather than appointing them as some currently do. Amendment 10 was placed on the November ballot by the Constitutional Revision Commission (CRC), a group that meets every 20 years to consider changes to the state constitution. Its critics charge that Amendment 10 is the worst example of “logrolling” by the CRC – putting several proposals together as one that force voters to either pass all or reject all in a “take it or leave it” manner instead of having separate proposals. Amendment 10 would also create the Office of Domestic Security and Counterterrorism within the FDLE. The Office “shall provide support for prosecutors and federal, state, and local law enforcement agencies that investigate or analyze information relating to attempts or acts of terrorism or that prosecute terrorism, and shall perform any other duties that are provided by law,” according to the amendment’s text. Lastly, the amendment requires that all counties go to an elected system for the county offices of sheriff, tax collector, property appraiser, supervisor of elections, and clerk of circuit court. Currently, some charter counties, such as Miami-Dade and Broward, choose to appoint some of those positions. The amendment would also prohibit those counties from abolishing any of those positions, transferring their duties to others, changing the length of the four year term of office, or establishing any other manner of selection other than by election. You can read more here on how this proposed amendment was created. All proposed amendments to Florida’s constitution require a 60% majority vote to be approved. As many of our readers are Floridians, it’s important to know how each of these measures can affect us and our families, businesses, and employees. Knowledge is power! 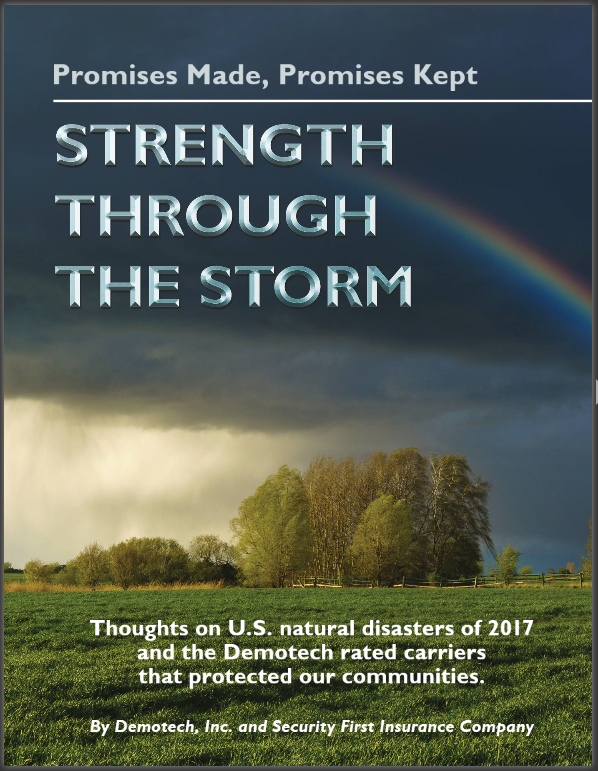 If you can, please read the Strength Through the Storm magazine that we mentioned in our opening to this newsletter. There’s so much bravery reported in that publication and as well over the past two weeks, as none of us could resist following the drama of the perilous crisis of the boys trapped in the Thailand cave…and the exhilaration when we heard about their survival after weeks of desperate attempts at rescue. And we wept during the coverage of the Navy SEAL who perished during the rescue mission. Bravery like none other. We wish for you cherished time with your families and friends as we progress during this hot summer. We look forward to hearing from you and appreciate your loyalty and commitment to reading our newsletter faithfully!